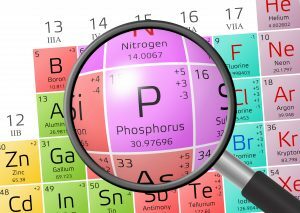 The availability of phosphorus (P) is critical during early growth to get turf grass off to a quick and healthy start because phosphorus is needed for strong root development. Phosphorus is found in the soil in both available and unavailable forms phosphorus in the soil solution must be continuously replaced or the turf will develop a deficiency. In acid soils, a secondary benefit can be realized from the addition of phosphorus. Aluminum (Al), which is highly soluble under acidic soil conditions, becomes toxic to turf grass inhibiting cell division in roots and reducing phosphorus transport from the turf roots. While both forms can be true solution liquid fertilizers, they definitely have different characteristics and chemical structures. Orthophosphate – Each molecule contains a single atom of phosphorus. In this form, a plant can readily absorb the phosphorus. Polyphosphate – Poly means “many” and refers to multiple linkages of phosphorus in each molecule.. Here the polyphosphate form must go through a chemical reaction converting it into the orthophosphate form to be readily available for the plant to absorb the phosphorus. Fazio Championship Blend liquid fertilizer products have a neutral pH with a low salt index, containing 80-100% of their phosphates in the available orthophosphate form. Orthophosphate is immediately available to turf grass during critical early stages of growth.